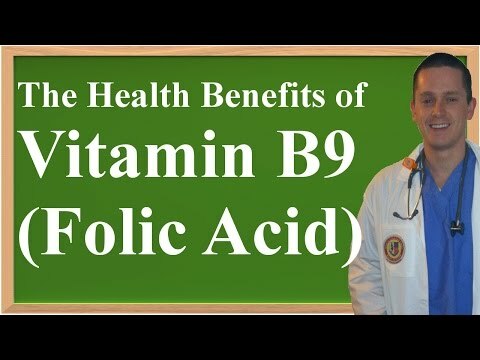 Vitamin B9, more commonly referred to as Folic Acid, is a water-soluble member of the B-vitamin family. This vitamin is easily broken down during the cooking process so care must be taken during food preparation. Also, because it is water soluble, the body can hold on to only small quantities. Since it is constantly being lost during food preparation and via the urine stream, it is important to continually resupply Folic Acid. Like the other B-vitamins, Vitamin B9 plays a role in the body's ability to metabolize fats, proteins and carbohydrates so they can be converted into energy. But Folic acid benefits the body in many other ways, too. Vitamin B9 is required to help form DNA and other nucleic acids. Since DNA and other nucleic acids are created along with new cell growth, this vitamin plays a crucial role in the body's ability to create red blood cells and the heart disease fighting amino acids called homocysteine. Folic acid also assists in the production of heme, the pigmented part of the red blood cells that carry iron. Folic acid also plays a significant role in the body's ability to repair damaged tissues. It plays a role in the development of serotonin, the neurotransmitter responsible for regulating sleep, moods and appetite. It helps with the digestion process. And it may help protect against the onset of cervical cancer. Ample quantities of Folic acid are also extremely important for any woman planning to conceive. Its presence can help protect the developing fetus from such dangerous conditions as spinal bifida. Four to six weeks after conception, the neural tube begins to form in the growing fetus. This tube ultimately becomes the spine, spinal cord, skull and brain. Closing the neural tube so amniotic fluid cannot seep in is the final step of the tube's development. Folic acid ensures this closure. Failure to close can result in birth defects including spinal bifida or anencephaly. Green leafy vegetables such as spinach and asparagus are wonderful sources of Folic Acid. Organ meats including liver and kidney also contain ample amounts of Vitamin B9. Nuts, beans and legumes, shellfish, poultry, pork, whole grains, citrus fruits, fruit juices and yeast are also good sources. Although excessive consumption of Folic Acid does not present a dangerous situation, care should be taken to keep consumption in moderation. Women should get 300 micrograms daily, and men should get 330 micrograms daily. Pregnant women, especially during the early stages of pregnancy, and women attempting to conceive should increase their intake of Folic Acid to 400 micrograms/day. An inadequate level of Folic Acid is probably the most common of the vitamin deficiencies. Especially at risk for this type of deficiency are the elderly, pregnant women, those who drink excessive quantities of alcohol and women taking the birth control pill. Depression, apathy, shortness of breath, dizziness, and anemia can all result from a Vitamin B9 deficiency. Problems with memory and impaired brain and nerve function can also result.